I've spent a fortune on native perennials. I've tried nearly every kind you can buy. But none is as reliable, in my experience, as the good old purple coneflower, which is drought tolerant, long-blooming, and self-seeding. This plant never lets me down. 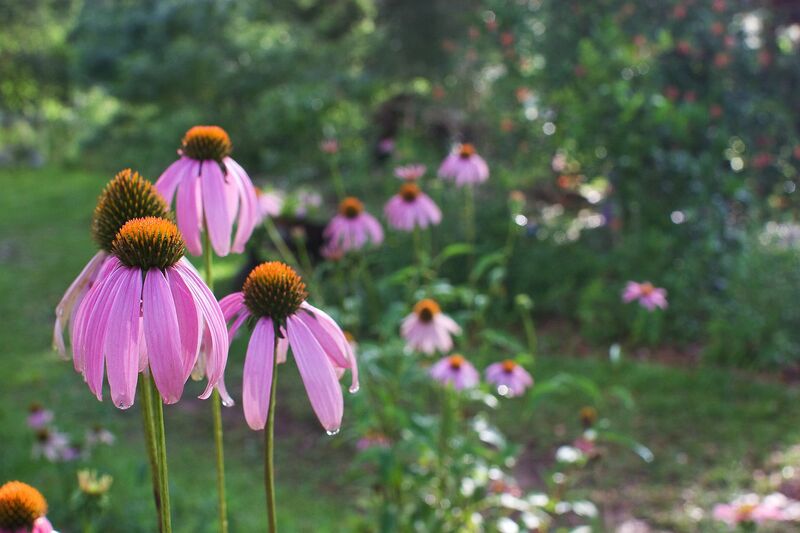 Purple coneflower is adaptable, growing in sun to part shade. It prefers moist, well-drained soil but can also grow in poor, sandy soil and red clay. I don't water my plants . . . or fertilize them or spray them with any sort of chemical. I don't do anything except fish for compliments about them: "So I don't know if you noticed my purple coneflowers . . ."
In North Florida, purple coneflowers grow anywhere from 2 to 5 feet tall. Even before they bloom, I find them quite attractive--straight and sturdy, with plenty of big, dark green, lance-shaped leaves. This year they started blooming in early May and are still going strong now in mid-June. The flowers, which consist of pink rays arranged around a coppery central cone, aren't at all delicate or fragile and make good cut flowers as well as nice roomy landing pads for pollinators. I don't deadhead my plants. Like I said, I mostly just leave them alone. Gradually, the cones turn black and are visited in winter by hungry goldfinches looking for seeds. The black cones don't look all that pretty, I'll admit, but the goldfinches make up for it. They're quite decorative perched on a stem on a cold winter day, with their canary-yellow bodies and zebra-striped wings. These fellows are a little shabby for some reason. Such great photos . . . I especially love how the sun is beaming down on Sophie in the last one. I too, have had difficulty growing coneflowers, although I love 'em! Yours are gorgeous. Enjoy them! Wonderful photos. Coneflowers have not done well for me this far south. So very pretty! 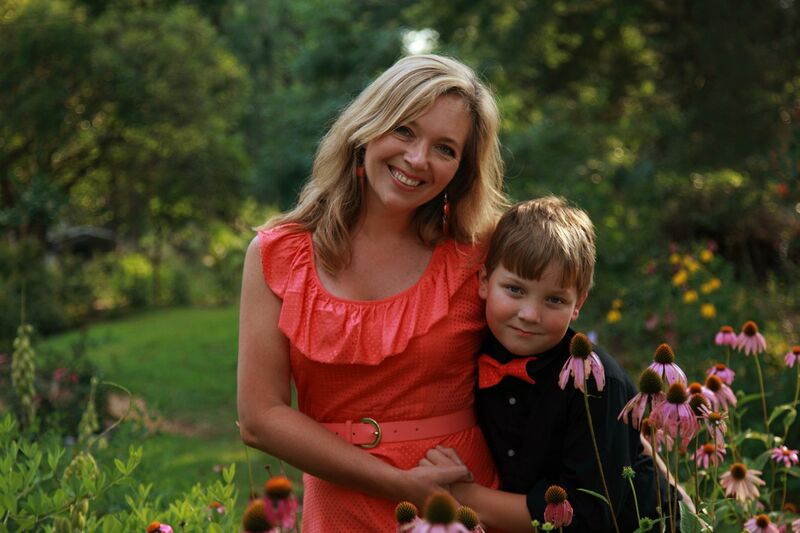 Love the flowers, your family, and photos. Great post, Leslie! Oh my, a coneflower explosion. I can't even imagine how beautiful that must be. They don't do that well here in the center of the state unfortunately. 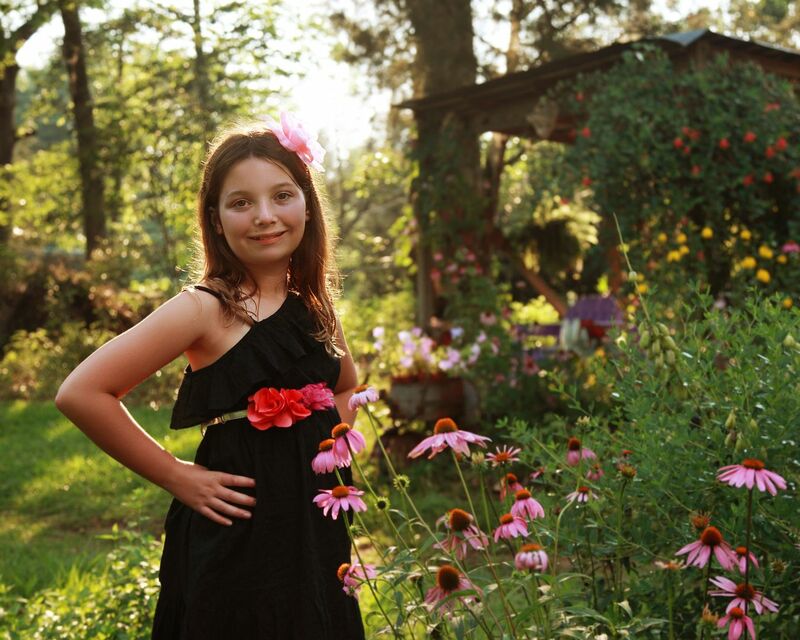 Your pics of the flowers are fabulous, as well as the ones of your sister, niece and nephew. The first pic of Jake is priceless with that look on his face. Enjoy your little piece of summer paradise. Hi Eli, thank you! I'm always kind of glad when coneflower season is over so I can quit compulsively photographing them. I wish I had a coneflower-growing secret, but I all I do is plant them and then leave them alone! Hi Daisy, thank you! My secret to coneflower success must be my more northerly location. Hi Lorraine, thank you! I was so happy--we got a tiny bit of rain today! Thanks, Jean. So nice to hear from you! Hi Tammy, thank you! 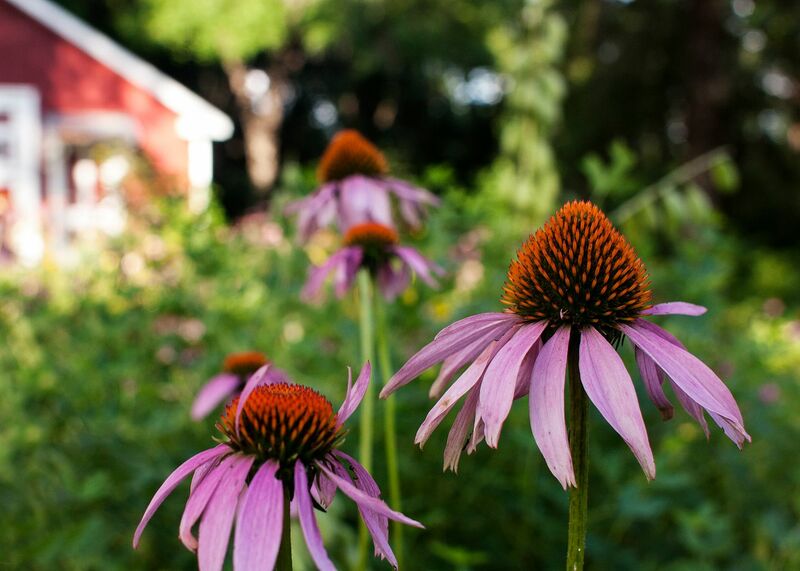 You should definitely plant some coneflowers. They would be a great addition to your cutting garden. Thanks, Staci! Do you get a lot of birds coming for the seeds? Thanks, Susan! 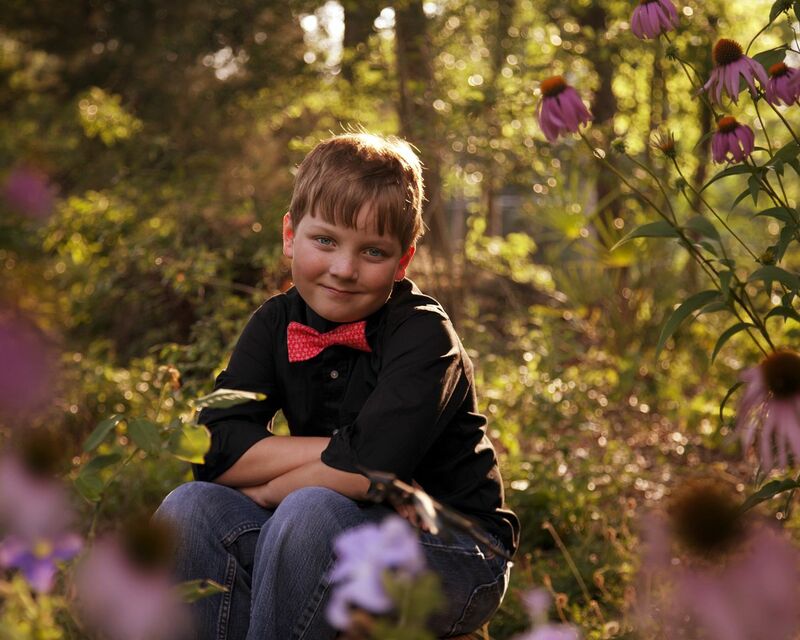 Jake will be very excited to see that he was singled out for compliments!